In ArchiSuite 16, ArchiTabula non è presente. Le sue funzioni migliori sono state integrate in ArchiTools. ArchiTabula è un plug-in di ArchiCAD per creare, ma anche importare, tabelle di testo o numeriche in ArchiCAD. Il contenuto delle tabelle può essere elaborato sia in forma di griglia sia, se le condizioni lo consentono, in forma di grafico o di diagramma, con vari formati ampiamente personalizzabili. Le tabelle realizzate e sistemate sulla pianta possono essere aggiornate nei contenuti in qualsiasi momento senza perdere la formattazione. Gli elementi posti sulla pianta sono oggetti di libreria, che mantengono un collegamento dinamico con il file dati, e la loro rappresentazione viene aggiornata direttamente, se si modifica il documento di origine. Per iniziare a lavorare con ArchiTabula occorre prima di tutto attivare la palette che contiene gli strumenti. Per fare questo è sufficiente aprire il menu ArchiTabula e scegliere la voce Visualizza palette ArchiTabula. Il comando è disponibile da qualsiasi finestra 2D (Pianta e Sezioni/Alzati). La palette è formata da sei pulsanti che aprono a loro volta sei funzioni diverse. Il primo Crea/Modifica foglio di lavoro permette di creare fogli elettronici dove si possono inserire informazioni di tipo testo, numeri e formule matematiche. L’utilizzo è simile a quello dei normali fogli di lavoro, l’unica limitazione, dovuta all’ambiente di svilullo API, è la dimensione del foglio di lavoro composto da 128 righe e da 64 colonne. 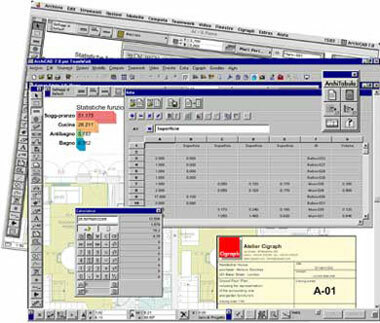 ArchiTabula consente di aprire i file in formato testo tabulato, ossia il formato di salvataggio delle Liste di Computo di ArchiCad e dopo la loro elaborazione essere salvate in formato .SLV ed inserite come oggetto nella pianta di lavoro di ArchiCad. Altra funzione di ArchiTabula è la calcolatrice, simile a quelle normali, ma con alcune caratteristiche che la renderanno molto apprezzata ai suoi utilizzatori: primo la possibilità di tenere in memoria fino a undici numeri, visibili nell’estensione laterale della calcolatrice e facilmente richiamabili; poi i pulsanti Leggi Lunghezza e Leggi Area, che consentono di rilevare i dati dimensionali degli elementi 3D e 2D presenti in pianta o nelle sezioni/alzato. Il metodo di lettura dei dati è doppio, ossia si può prima selezionare gli elementi in pianta e poi attivare le funzioni di lettura oppure fare l’inverso. Ovviamente anche questi valori possono essere memorizzati nel display della calcolatrice. Con ArchiTabula si possono anche creare tabelle utilizzando lo strumento Gestione Oggetto Tabella. I file di riferimento sono quelli precedentemente creati in formato .SLV, e vengono aperti direttamente nella finestra di dialogo. Sempre nella stessa finestra si possono impostare tutta una serie di caratteristiche grafiche come il colore di sfondo della tabella, o i font da utilizzare. La tabella messa nella pianta è un oggetto di ArchiCAD e come tale può essere riaperto e modificato. Utilizzando sempre i file nativi .SLV, si possono creare anche grafici, con lo strumento Gestione Oggetto Grafico. Facile e immediata è la scelta del tipo di grafico che si vuole visulizzare, grazie ad una serie di icone riportate nella finestra di settaggio. Come per le tabelle anche per i grafici si possono settare tutte le informazioni sui font, le dimensioni e i vari colori di visualizzazione. La funzione Crea/Modifica Legenda, crea una legenda con una struttura predefinita, suddivisa in vari riquadri, che cambiano la loro dimensione in base ai dati in essi inseriti. Interessante la possibilità di visualizzare il proprio logo, modificandone la dimensione e posizione. Ovviamente i font utilizzati possono variare da riquadro a riquadro. Una volta impostata la legenda può essere registrata e posta in pianta come oggetto. I simply want to tell you that I’m beginner to blogging and absolutely enjoyed this website. Almost certainly I’m planning to bookmark your site . You really have wonderful writings. With thanks for sharing with us your blog. certainly like your web-site but you have to check the spelling on quite a few of your posts. A number of them are rife with spelling problems and I to find it very bothersome to inform the truth however I will surely come again again. Thanks a lot for sharing this with all folks you really realize what you’re speaking approximately! Bookmarked. Please also consult with my website =). We may have a hyperlink alternate arrangement between us! Thank you a lot for providing individuals with an extremely terrific chance to discover important secrets from here. It is often very pleasurable plus jam-packed with fun for me personally and my office co-workers to search your website at minimum three times weekly to find out the new items you will have. And definitely, I am just usually contented for the superb tactics you give. Some two facts in this post are really the most beneficial we’ve ever had. I really like your writing style, wonderful info, thanks for putting up :D. “I will show you fear in a handful of dust.” by T. S. Eliot. hi!,I like your writing so much! share we keep in touch extra approximately your post on AOL? I require an expert on this space to solve my problem. May be that is you! Looking forward to look you. Wow, superb weblog format! How long have you been running a blog for? you made running a blog glance easy. The overall look of your site is fantastic, as well as the content material! I am only writing to let you be aware of of the notable experience my friend’s girl experienced going through your web page. She mastered many things, most notably what it’s like to have a wonderful giving mood to let the others with no trouble gain knowledge of chosen extremely tough things. You really surpassed people’s desires. Thank you for delivering these valuable, trusted, revealing as well as fun guidance on that topic to Emily. Needed to create you one very small observation to finally say thanks over again relating to the breathtaking knowledge you’ve contributed on this website. This is simply tremendously generous of people like you to present freely all that many individuals would have supplied as an e book in order to make some bucks for themselves, most importantly since you could have tried it if you considered necessary. Those principles also served to be the fantastic way to know that some people have the same interest similar to my very own to realize more on the topic of this issue. I know there are many more pleasurable moments in the future for folks who look over your website. Wow, wonderful weblog layout! How lengthy have you been running a blog for? you make running a blog look easy. The total glance of your site is fantastic, let alone the content! Useful info. Fortunate me I found your web site unintentionally, and I’m stunned why this coincidence did not came about earlier! I bookmarked it. What i don’t understood is in reality how you are no longer actually a lot more neatly-appreciated than you may be right now. You’re so intelligent. You recognize therefore considerably with regards to this subject, made me personally consider it from numerous numerous angles. Its like women and men don’t seem to be fascinated unless it¡¦s something to accomplish with Woman gaga! Your personal stuffs outstanding. Always maintain it up! I want to point out my affection for your kind-heartedness giving support to folks that really want guidance on this niche. Your special dedication to passing the message all around ended up being astonishingly advantageous and has truly allowed men and women like me to arrive at their dreams. Your amazing invaluable advice indicates much to me and somewhat more to my office workers. Warm regards; from everyone of us. wonderful submit, very informative. I ponder why the other specialists of this sector do not realize this. You must continue your writing. I am sure, you’ve a great readers’ base already! What i do not understood is in truth how you’re no longer actually a lot more well-appreciated than you might be now. You are very intelligent. You already know therefore significantly on the subject of this matter, produced me individually consider it from a lot of numerous angles. Its like men and women don’t seem to be fascinated unless it is one thing to do with Girl gaga! Your individual stuffs excellent. Always handle it up! Thank you a bunch for sharing this with all folks you actually know what you are talking approximately! Bookmarked. Please additionally discuss with my website =). We could have a hyperlink exchange arrangement between us! Very efficiently written post. It will be helpful to everyone who employess it, including me. Keep doing what you are doing – can’r wait to read more posts. I would like to thank you for the efforts you’ve put in writing this blog. I am hoping the same high-grade blog post from you in the upcoming also. In fact your creative writing abilities has inspired me to get my own website now. Actually the blogging is spreading its wings quickly. Your write up is a great example of it. Some truly great content on this website , regards for contribution. I truly enjoy reading through on this web site , it has got great content . “Violence commands both literature and life, and violence is always crude and distorted.” by Ellen Glasgow. you’re truly a just right webmaster. The site loading velocity is incredible. It seems that you’re doing any unique trick. Moreover, The contents are masterpiece. you have performed a great job on this subject! Fantastic site. Plenty of useful info here. I¡¦m sending it to several buddies ans additionally sharing in delicious. And certainly, thanks on your effort! you are in reality a excellent webmaster. The web site loading velocity is incredible. It kind of feels that you’re doing any distinctive trick. Also, The contents are masterpiece. you have done a excellent activity in this matter! Nice post. I was checking continuously this blog and I’m impressed! Very useful info particularly the last part 🙂 I care for such information much. I was seeking this certain information for a very long time. Thank you and best of luck. I can’t believe the quantity of spam that your website is getting hit with. When you need any assist with deleting the spam comments please email me. Hiya very nice blog!! Man .. Beautiful .. Wonderful .. I will bookmark your site and take the feeds additionally¡KI’m happy to seek out numerous helpful info here in the put up, we want develop extra strategies on this regard, thanks for sharing. . . . . .